Building relationships with the corporate sector that translate into corporate sponsorship can be a valuable form of earned revenue and unrestricted dollars for your organization. The right sponsors can become long-term partners, and structured properly, these deals can mean tremendous visibility for your organization. The negotiations and nuances can be tricky, so building your competencies will enable you to acquire the best partners. Here are 17 tips to get you started. DO educate yourself about what corporate sponsorship is and why corporations deploy it. For your organization, sponsorship may be a form of earned revenue. However, for businesses, sponsorship is an extremely powerful marketing vehicle characterized by a well-designed experiential component. To fully leverage sponsorship, deepen your knowledge. DON’T sell generic packages, like Gold, Silver & Bronze. 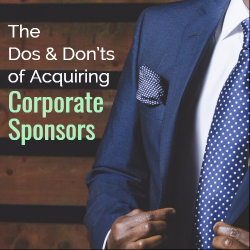 You’re leaving a lot of money on the table and sending the wrong signals to prospective corporate partners. DO know what sponsorship is not. In both nuanced and more significant ways, sponsorship is different than corporate giving, corporate philanthropy, membership, being an exhibitor, advertising, and cause marketing. This may sound like hair-splitting, but the distinctions can mean tremendous lost revenue. DON’T underestimate your value. If you don’t believe that what you have to offer is valuable, how will you be able to convince someone else? Too many mistakes are when organizations are blind to their treasures. DO use a healthy dose of creativity to develop opportunities. Creativity fuels marketing and causes existing and potential customers to pay attention. DON’T treat your sponsors like ATM machines. A fantasy organizations sometimes have is that corporations will pay for their event, program, initiative etc. The business sector may be an important part of your business model, but there’s a lot more to it than that. DO develop a compelling fee strategy. Base your fee structure on value, rather than your costs or some arbitrary valuation formula. DON’T undervalue in-kind sponsors. Sponsorship is an exchange value for a fee. If a sponsor provides that fee in in-kind value, substantially relieving your budget, what you’ve received is as good as cold cash. DO build organizational competence. The individual responsible for sponsorship cannot be a lone wolf. The organization must decide strategically to develop sponsorship as a revenue source, and everyone must operate in alignment with that decision. DON’T fool yourself about who’s making the decision. If the person with whom you’re speaking or working is not authorized to make a payment, reprioritize a budget, or is unclear what business outcomes the company seeks, you’re most likely not speaking with the right person. DO begin your business development effort at least 1 year out. The sponsorship sales cycle is long for several reasons, one of which is because you want your sponsors to derive full value from all you have to offer. DON’T assume sponsorship is the best revenue source for your organization. Corporate sponsorship is a powerful marketing medium for businesses and a great source of revenue and visibility for organizations. However, without the right conditions in place, you could be wasting your time and undermining your future value. For example, start-up organizations rarely have sufficient value to offer. Holding off until the organization is more established and has the appropriate capacity is generally a better course. DO leverage your relationship capital. The broader your organization’s network, the more easily you’ll be able to meet the right people who can influence decisions about your sponsorship program. Get out of your office and regularly meet people in the business community. DON’T disregard your mission to accept a sponsor. The right partners are in alignment with your mission. Do not twist yourself into a pretzel, compromising your integrity and values. Spend time to find the right partners. DO develop clear policies to guide your program. Avoid being blindsided by internal and external forces by having these policies in place and part of your strategy. DON’T let fear undermine your efforts. Fear can show up in several places throughout your operation — setting fees, negotiating, prospecting, executing, and initiating relationships are just a few. The results will always be weakening, if not detrimental. DO set integrity and quality relationships as your standard. While you have no control over how your partners interact with you, you can control your intentions and standards. Strategically your relationships should be set on high levels of importance, trust, and integrity, setting the foundation for long-term partnerships.